Trade Pulse is an important part of ImportGenius.com's mission to democratize global trade. ImportGenius.com today released TradePulse, a free service to make it easier to understand U.S. importing trends for any product. By mining over 66 million ocean freight shipping manifests, the company's research scientists have long given clients privileged access to information on what America imports every month. The firm is now opening much of this data to the public for free, allowing members of the public to run free searches to view shipping volumes for any product. 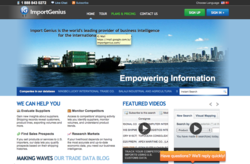 Visitors to ImportGenius.com/pulse will find a simple form to enter the name of any product to view the number of shipments of that product imported into the U.S. by ocean during their selected time period. The tool makes it easy to compare imports of two different products too: simply type the term "vs" between the product keywords to see both products importing trends on the same graph. For example, a search for "solar vs wind" reveals at an instant that the U.S. imports way more products with the term "solar" on the shipping manifest's product description than we do products containing the term "wind"." Meanwhile, a search for "Skis vs Snowboards" shows that skiers still hold a narrow lead over snowboarders, at least in terms of imported shipments using those terms. Recognizing the power of online sharing, Import Genius made it super easy to share the results of any search: there's a "Tweet" button on every graph. As a free service, TradePulse compliments the company's paid offerings which allow Import Genius clients to actually see the names of the company's importing the goods as well as the identities of their suppliers around the world. "We're working hard everyday to make American import data more accessible" says Import Genius Co-Founder Michael Kanko. "While offering better tools to our subscribers is always our first priority, bringing out free services like Trade Pulse is also an important part of our mission to democratize global trade."